It is no secret that bullying experiences in youth can affect people’s lives. They may lead to poor mental health, emotionally scaring people who are targeted by bullying. We’ve all experienced a few bullying assemblies in grade school where they teach us to “treat others how you would want to be treated” and “step in when you see something wrong!” However, these assemblies often don’t touch on what will happen to targets of bullying if these messages are ignored and bullying continues. A small, but growing body of research is starting to examine the long-term consequences of being targeted by bullying. Dr. Earnshaw and her colleagues sought to examine associations between bullying, mental health, and substance use over time. How did they conduct the research? It was executed longitudinally, or over time. It explored whether certain youth were more vulnerable to bullying. It examined depressive symptoms as a mediator. It tested several substance use outcomes, including alcohol, marijuana, and tobacco. Longitudinal– This study included the same participants over several years. They worked with participants from 5th to 10th grade, and were able to measure the long-term of peer victimization. Previous studies that have been done on this topic often worked with participants at one point in time. Vulnerable- The authors examined whether certain youth experience more frequent bullying, including boys, sexual minority youth, and youth with chronic illnesses. Mediator– They focused not only on peer victimization’s associations with future substance use, but on the possibility of peer victimization being associated with depressive symptoms, which may then be associated with substance use. They interviewed people about their experiences of peer victimization in 5th grade, then followed up with them in 7th grade to discover signs of depressive symptoms, and finally interviewed them about their substance use in 10th grade. Depressive symptoms were examined as the middle point of this chain reaction. Outcomes– Each participant reported whether they used alcohol, marijuana, and tobacco in the past 30 days. They found that alcohol was the most used, marijuana was the second most used, and tobacco was the least used by youth in 10th grade. They also found that more frequent 5th grade peer victimization was associated with more 7th grade depressive symptoms. 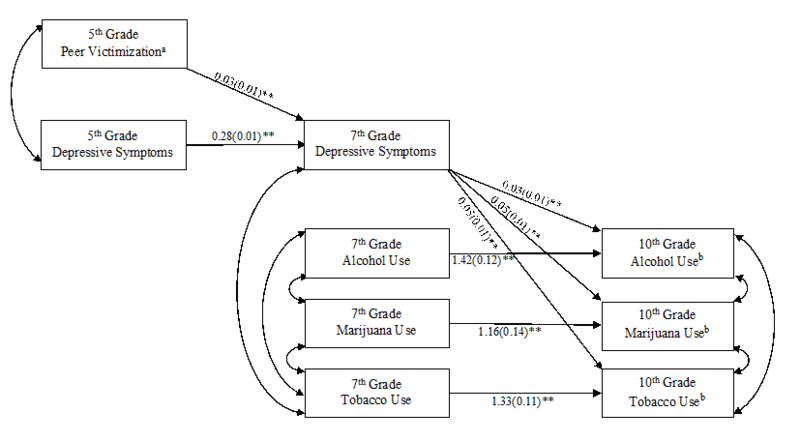 And, more 7th grade depressive symptoms were associated with greater likelihood of 10th grade alcohol, marijuana, and tobacco use. They also found that boys, youth with chronic illnesses, and sexual minorities all experienced more peer victimization in 5th grade. Overall, their findings suggest that youth may use substances to ease painful emotions resulting from bullying. Their findings suggest that youth who have been bullied in elementary school may experience distress by middle school and turn to substance use by high school, perhaps to cope with feelings of distress. Also, some youth are more vulnerable to bullying, including boys, youth with chronic illnesses, and sexual minority youth. There is the possibility that other variables that were not examined in the study may have an effect on these findings, such as traumatic stress, low academic achievement, and social and school-driven support. Additionally, the authors did not look at the possible substance use of the bullies themselves. Further research on this topic is needed to continue to understand other aspects of this topic. Looking onward, Dr. Earnshaw and her colleagues recommend that teams of pediatricians, parents, and teachers come together to spread awareness about bullying and work on interventions to prevent the development of depressive symptoms and substance use disorders due to peer victimization. You can also read about this study in: UDaily, Reuters, Mashable, Newsworks, DrugRehab.com, and other sites. Reference: Earnshaw, V. A., Elliott, M. N., Reisner, S. L., Mrug, S., Windle, M., Tortolero Emery, S., Peskin, M. F., Schuster, M. A. (in press). Peer victimization, depressive symptoms, and substance use among youth: A longitudinal analysis. Pediatrics.